The wonderful thing about soup is that there is one for just about every occasion. Craving something light? A vegetable soup will do just the trick. Stomach rumbling for something hearty? Fire-roasted tomato sounds about right. How about something loaded with unique spices and flavors? Black bean and roasted poblano soup will hit the spot. Whichever variety you're craving, Arkansas has a soup place for you. Here are our favorites. Oh Jeff! We love your Clubhouse! This spot’s weekly soup menu is so good that you’ll want to check out the special for each day of the week. If broccoli cheddar or chicken & dumplings are your jam, then go on a Monday. On Wednesdays you’ll find swiss onion and cream of tomato. Craving some white chicken chili? Check out Jeff’s on a Friday. Get your reservations in today to try out this joint! From the awesome atmosphere to the eclectic menu, it’s no wonder that 21 West End has become a Fort Smith hot spot. You’ve got to try the house bread bowl full of clam chowder! Other yummy favorites include the French onion soup and the crab and crawfish bisque. Stone Mill Bread Company is a Fayetteville favorite. 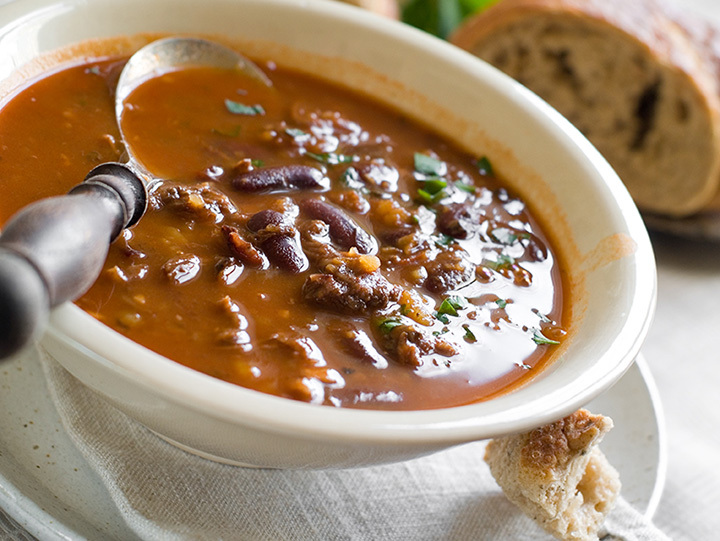 These soups are made from scratch using fresh ingredients. Depending on what day it is you’ll find classics like fire roasted tomato, chicken and dumplings, creamy potato, and chicken tortilla. When it comes to Mexican flavors, this is one of the best spots in the River Valley area. El Zarape does not disappoint when it comes to soup! Check out the tortilla soup, the black bean soup, or the roasted poblano soup. Can’t decide? Order the twin soup and get a delicious combo of the black bean and roasted poblano. Lookin’ for some Southern-style soup? Check out Fort Smith’s Calico County for some tasty homemade options. Local favorites include the cheese broccoli soup, the vegetable soup, and the soup of the day. Bentonville’s Pressroom is a hip little joint that you’ll love. While this spot isn’t necessarily known for their soups, they do serve up a great bowl. Check out the awesome tomato soup or ask your server about the soup of the day. This New York-style delicatessen quickly made a name for itself in Fort Smith. River City Bistro offers some outstanding homemade soups that you’re gonna love. Try the Italian wedding soup, the Chicken noodle soup, or the matzo ball soup. Or, if for some reason none of those sound appealing, ask about the Soup Special for the chef’s choice. All of the soups at this Little Rock spot are made with special recipes and served with garlic bread. In addition to the daily soup specials, EJ’s serves up delicious soups like tomato basil, broccoli cheese, and pepper jack chicken. They’re all good choices! Okay, yes, this is a coffee house, but the soups they serve are amazing. Grab a hot cup of a joe and a hot bowl of soup while you're here. Just ask the barista for the soup of the day and enjoy!